PCC is baggin’ my veggies: why? 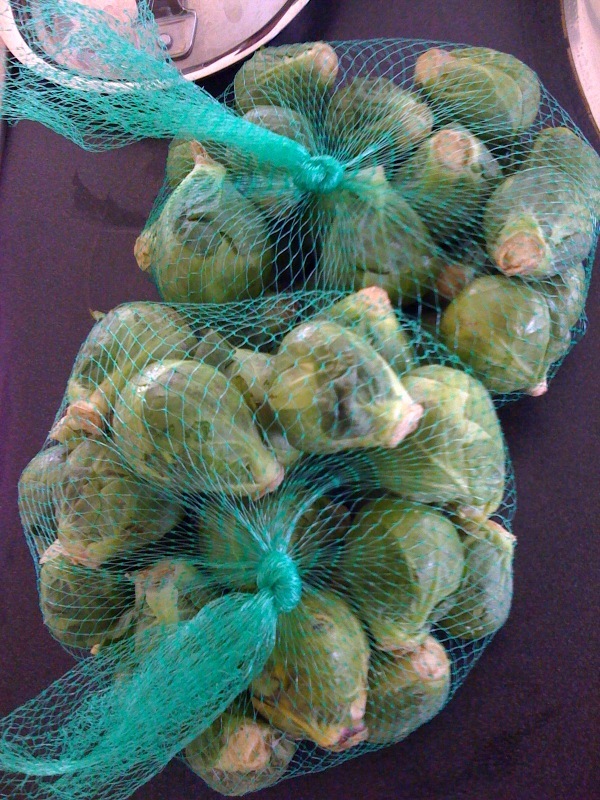 It’s a little thing, but it has now taken on a gigantic irritation quotient in my brain: PCC uses this funky, straight-to-the-landfill plastic netting on many of the vegetables, such as brussel sprouts above, green beans and the like. Why this bugs me: the netting is completely non-reusable, and face it: my relationship with PCC is a values-based thing. I don’t go there because they have the best price. I go there because their values are supposed to be somewhat in line with my own. And my values are like this: I re-use & recycle to the degree possible. That means: as much as possible. These little green mesh bags? Not so much. Can’t re-use, can’t recycle…in fact, they’re a total waste, not to mention that if I want a lot (and I do, I eat a LOT of vegetables), I have to buy sometimes two or three of these plastic mesh packages. So when I asked Kevin, the veg manager at my local PCC why PCC has suddenly started using them, his answer so completely underwhelmed that I just walked away: because “it’s easier to stock with the mesh bags, and there’s less mess to clean up.” No. Really. So, I went straight away to Metropolitan Market, it has a pretty wonderful veg and fruit section, and guess what! Their sprouts and green beans? Free as birds, no plastic mesh wrap. And guess what else! None on the floor. No mess. So I bought some of the green beans, and if this pattern continues, I may be heading over to Met Market for all my shopping. I do like it better in many ways. I work hard to avoid putting more stuff in the land fill. I prefer to partner with organizations that are sensitive to the issues as well. As I said, it’s a small thing…but those small things tend to have outsize power over time. I’ve been humming the tune of This Sweet Old World today, floating between grief and disbelief over the BP Spill. This isn’t a scree about that mess, I don’t know what can really be said. BP should promise flat out that it will do anything and everything possible to make this right, simply, clearly, no hedging. Yesterday I had a minor medical treatment that involved a small incision and some stitches. No big. But I was somewhat dumbfounded when over the course of 25 minutes I saw the assistant put on, remove and toss in the garbage no less than six pairs of latex gloves. No, really. Six pairs. Right in the plastic bag that held the growing mound of waste that would be collected up and thrown somewhere. The ocean probably. Ok. Picture this: my little treatment happening at that moment, hundreds and hundreds of times yesterday all around the world…cuz yeah, it wasn’t very exotic. And then imagine more complex treatments, and full out surgeries. 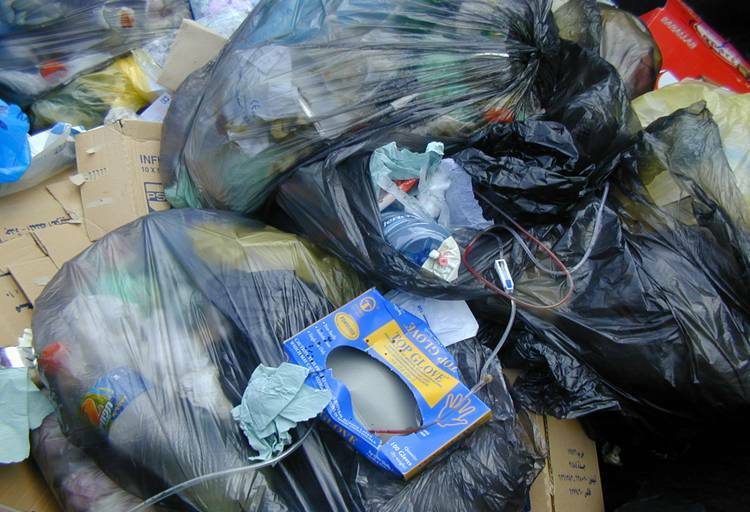 Imagine the amount of plastic bags full of latex and plastic wrappers emanating from those hospitals all around the world. So I’ve been thinking about this. Rolling it around in my head, along with the beached whales this summer and their stomachs full of plastic, and the ease of plastic, and the mindlessness of plastic and then a talk by Bill McKibben gave on NPR the other day and his new book, Eaarth, which argues for the end of growth. Consider: the growing universe of germs is due to an ever increasing population that is ever increasing its number of cure-all antibiotics that the invisible microbial world mutates to conquer again and again and again. Consider: the more people we have, the more resources we use, in an obviously limited world. Consider: the dwindling resources requires us to take ever more extreme actions to supply the ever increasing population of humans demanding ever more of everything, while believing there is no cause-and-effect–magic!. There is a report today about the impact slowing down– reducing driving speeds– would have in a systemic way...proof positive that a small thing can make a big difference. We could do this, but as a nation, the idea of slowing down is insulting, not to mention unenforced, and basically any questioning of our power to do what we want, when we want, and at the speed we want, is generally viewed as unpatriotic. Our magic thinking has gone round the bend. There are things we could do. You and I both know there are things we could do differently, for the sake of this sweet old world. Take a look at some photos from the front–the front being that stretch of sea that holds the world’s biggest floating garbage patch. Will it someday come to be known as an “oceanfill” like landfill? Chris Jordan’s work is entitled “Art, Grief and Transformation.” As he says, the grief of seeing wildlife killed by having ingested plastic it thinks is food is nearly too much to contemplate. The amount of plastic we are producing, discarding, and sending into the food chain is unfathomable. Our disconnect from the reality of overpopulation and over-consumption is stunning. How did we evolve to such a level of magic thinking? World Water Day: two great vids, and maybe just for today, don’t be afraid of your tap. First video clearly, and with a good sense of humor, highlights how the bottled water industry (Pepsi, Coke, Fiji, etc) have used stark fear to manufacture the demand for bottled water. I’ve switched to drinking from the tap over the last year; we use a regular old filter. No big. This video shows the horrendous life-cycle of bottled water, and how much it really really costs. And did you know how many cargo ship loads of water bottles end up as mountains of plastic garbage in India. Think about that next time you toss a plastic bottle in the “recycle” bin. More here, it’s a good–and clever–video. Second video from Surfrider association. I hope every school in the world streams this in for their kids to watch, if only so they can know what they’re inheriting from us. The Cycle of Insanity: The Real Story of Water from Surfrider Foundation on Vimeo. Over at the HuffPpost, Laurie David is chronicling Charles Moore’s exploration of the path from the California Coast to the northern waters of the Hawaiian Islands. The goal? Plastics. He’s aboard the Algalita, a research vessel dedicated to studying the impact of plastics on the environment of the world’s oceans. He will be sending regular emails describing their findings, and Laurie David will post them on the HuffPost. I look forward to following the adventure, and hope you’ll help spread the news about this research that affects us all. In the annals of things I would not have thought needed improvement: pancake mix containers. There’s someone somewhere who’s job it is to figure out how to improve on things that work fine in order to sell more products, and I think that might not be a very good use of someone’s time–I don’t care how much they earn. 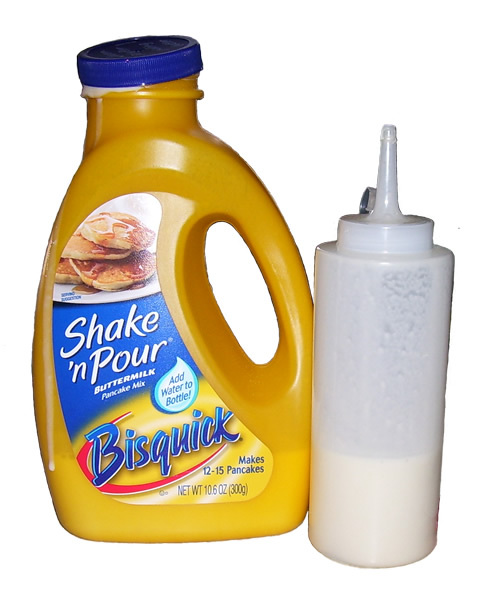 Take Bisquick’s Shake ‘n Pour bottle of pancake mix. Is it really so very very difficult to make pancakes from the mix in a box? Do we have to make a plastic bottle to hold a chemically processed liquid so all you have to do (we’re very very busy!) is shake it and pour it out? I happened to see this product on TV the other day and really was taken aback. Plastic bottle: will not decompose in that very busy Mom’s lifetime, nor the span of her kid’s, or even their kids. Pancake mix: processing and shelf life virtually guarantee there is zero health benefit to the “food”–it’s just filling bellies, and likely has so much sugar and salt that the kids would be better off with a slice of toast and peanut butter. Much better off. I know, I know–why should I care? But I’ll tell you why: I just spent a few days with my nephew who is 34 and fights with diet/nutrition issues. He’s grown up in a mass-consume culture, more accustomed to the taste of processed sugar than real food, and now when he’d like to change things, it’s extremely difficult. And as he gets older, his health problems will increase, his dependence on medications will increase, his positive participation in our culture will decrease–and that breaks my heart. This is our culture, people. This is our country, our culture. I literally don’t think having a plastic bottle of pancake mix is making us any better–it’s just growing profits for General Mills. Which brings me to John Edwards. I read the other day, though I can’t find it now, that some columnist was backing John Edwards, against all odds, because he felt that one of the core problems in our country, if not the world is the rise of unchecked corporations and of all the candidates out there, the one candidate that truly understands corporations and how to battle them effectively is John Edwards. It strikes me that that reason alone may be contributing heavily to his virtual invisibility in the run-up to the race. I’m not suggesting I’m backing Edwards–in fact, I don’t know yet who I’m backing. Any of the top three would be good, to be honest. But the issue with corporations is exceptionally important. We are currently suffering the burden of the polar opposite of Edwards: an administration so thoroughly in lock-step with corporations, the relationship is nearly seamless. Apologies to Edwards for discussing General Mills’ ridiculous products in the same post as the presidential nominee, but in terms of corporate hunger for products above brains, it seemed to connect up for me.